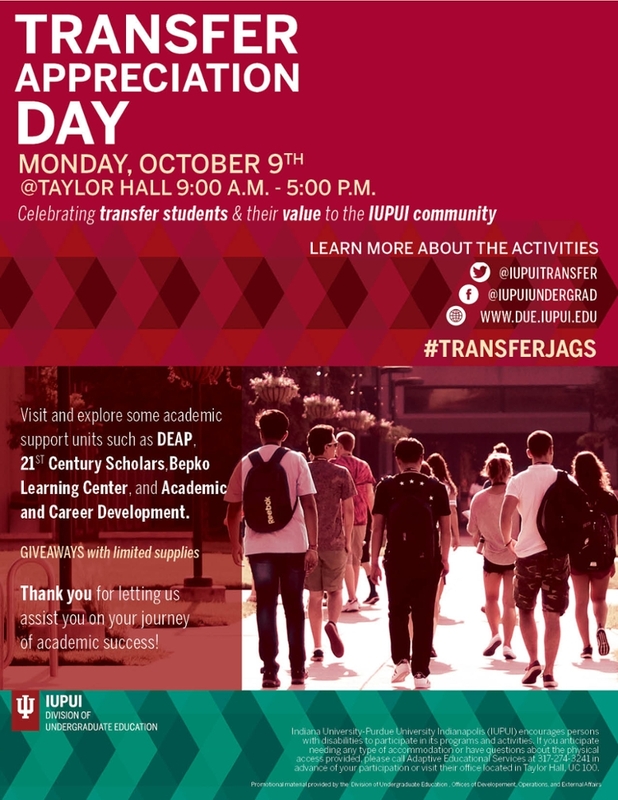 Indianapolis, IN (October 2017) – IUPUI’s Division of Undergraduate Education will celebrate transfer students and their value to the IUPUI community in Taylor Hall on October 9, 2017, from 9:00 a.m. to 5:00 p.m. All undergraduate transfer students are encouraged to visit the division’s academic support units to gather information and to explore the unit's services and resources. The Diversity Enrichment and Achievement Program, 21st Century Scholars, Academic and Career Development, and the Bepko Learning Center will offer giveaways while supplies last. With over 1,300 transfer students enrolled at IUPUI this fall, the Division of Undergraduate Education maintains its commitment to the retention and success of transfer students through events like Transfer Appreciation Day. Other schools on campus are also offering special activities in honor of IUPUI’s transfer students. To learn more about Transfer Appreciation Day activities, visit Twitter, Facebook, or the division’s website.